Thanks to feedback from initial users, the launch of the Nexus Q has been put on hold. The music and video streaming orb will eventually return to the market and will "do even more than it does today". According to the email Google sent out to those who pre-ordered the device, the industrial design and hardware received high marks, but users wanted the device to do more. 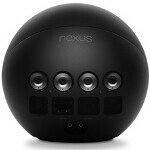 Those who pre-ordered the Nexus Q will receive for free, the same unit that was given to those who previewed the orb. According to the email, Google will not charge your card for the revamped Nexus Q which you will have to buy when it is launched, or for the preview unit that you will receive. The idea behind the device was to stream music, video and YouTube clips from any phone running Android 2.3.3 or higher through Nexus Q connected devices in your home. Google did not give a date when the revamped device will be on sale. To thank you for your early interest, we'd like to extend the Nexus Q preview to our pre-order customers and send you a free device. If you had other items in your order, your credit card will be charged for those items only. Google is the most admired companywithout a doubt. Look at what others are doing: they try to limit customers' choices for their own greed. Google never does it, they attract users buy offering huge value for money and never restrict people's freedom. They'll definitely ramp it up now. Can't wait, maybe it'll be a bit more worth the money now!! http://www.youtube.com/watch?v=7F5FO-MyR0o that help you out? i know WHAT it does but i don't understand why that functionality justifies it. now that's customer service for you! Make it a media center please! Add a BT multi-media remote and or gaming controller, with Jelly Bean for your TV. Now you got somthing. It needs HDMI too. I bet(hope) this is where they are going with it. Now Google's next big update will to unite the phone, tablet, and TV. Apple would never ever do something like this in a million years. Lol. it's kind of like Apple TV isn't it? 1st off. Kinda but what Apple has is very limited. Apple TV will only see files (video, music, and more) that has been loaded into iTunes. Not the case with Google. Say hello network, and that's it. All of my videos, music, and more are now on my Android device with in minutes. It is also very hard to hook a gaming controller to Apple TV, it's doable but a pain to do so. Again not the case with Google. You get so much more with the Android option. Can you use whatever app to view your media with Apple TV? No you can't. You can with Android. By that time or even now. Just launch the XBMC app, or whatever app you want. 2nd. Apple did not invent everything, especially this not even close. They've been doing this for years on HTPCs. Long before Apple's miserable attempt at it. Apple came along and made this technology proprietary, limited, and locked down. Here comes Google doing it themselves whether it's from itself or an OEM, they just do it open. I'm sorry you can do almost (ALMOST!) everything you can do on an Android device that you can do on a HTPC, and it's much cheaper. Can Apple say this? No they can't. They are very limited in this technology. Sorry but I will be looking forward to an Android and or Nexus option. I see upgrades to impliment "Ouya like" features being added to the Nexus Q in the near future...... mark my words.... The Nexus Q will become a game console.